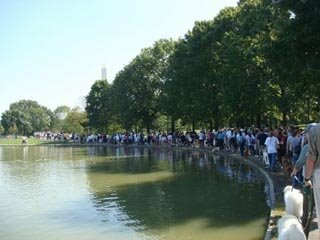 A big supporter of animal rights, I was happy to participate in the 3rd Annual Humane Society Walk for the Animals in Washington, D.C. I volunteered at the registration table before the event, so I wasn’t able to bring my own three doggies. However, I wore a button that showed I was walking in their honor. As the crowd grew, there was a sea of doggies of all sizes and breeds. The energy level was high and not surprisingly, the dogs were experiencing sensory overload. Activities prior to the walk included doggie yoga, an agility course, contests for owner-look-alike and best dressed canine and a microchip clinic. There was a cute doggie water station. The band Redline Addiction provided great live music. My friend Karina joined me for the one-mile scenic walk around Constitution Gardens. The only disappointment to a majority of the attendees — the walk was too short. There were approximately 2,000 participants and more than $97,709 was raised. The Humane Society is continuing to collect donations until November 7.